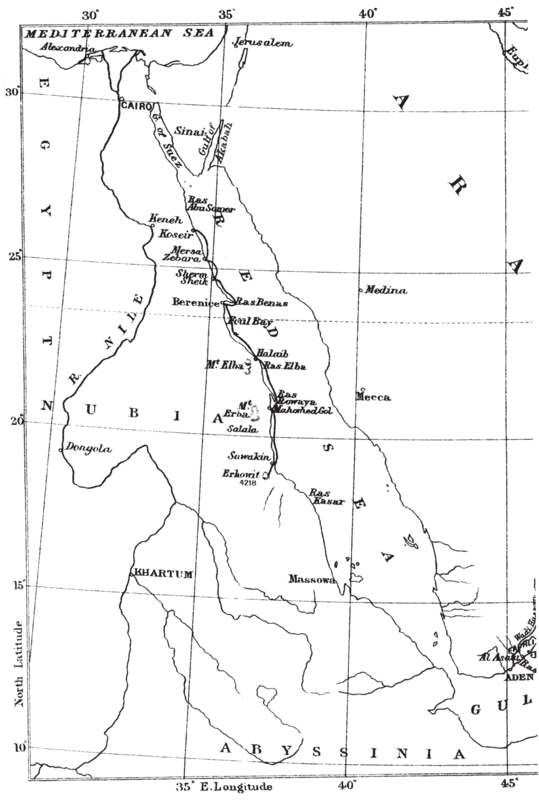 The Bents’ short (but eventful) exploratory period through ‘Abyssinia’ in the spring of 1893 had provided Theodore with clues, inscriptions and other finds that seemed to support his theories linking early Ethiopian settlements to the Mashonaland monuments, via old trade routes that flowed east-west across the Red Sea and drove the economies of early-first-millennium societies within the southern Arabian peninsula. It was this latter region that now monopolized Theodore’s attention for the rest of his career: if Greece and the eastern Mediterranean had been his apprenticeship, Mashonaland and ‘Abyssinia’ had set him centre stage, and he now hoped his ‘Southern Arabian’ labours would see him ushered to the front of it – his chronicler, Mabel, by his side. After lengthy discussions with the Foreign and India Offices, Theodore was eventually granted permission to embark for Aden and the Yemen in November 1893, under the strictest instructions not to conduct himself in any way that might cause an incident with the Sublime Porte. The Bents returned to London ahead of schedule, on 20 April 1894, with Mabel recording in her Chronicle: ‘I am thankful to say the efforts of the Expedition in all branches seem to be approved of’. Certainly a pioneering exploration, their finds in the region however were modest and they failed to reach either Shabwa to the west, or to penetrate the eastern extremity of the Wadi Hadramaut (Wadi Masila). The party was forced to curtail its mission and take a shortcut to the coast and return, somewhat despondently, to Aden. By early December (1894) the couple had reached Muscat. Their first objective, the immediate mountainous hinterland to the west, the notorious ‘Empty Quarter’, was considered too dangerous, so they embarked for Merbat (Mirbat), several days south-west along the coast, making for the southern district of Dhofar. From here they were to explore inland, along the old frankincense and myrrh trails, and Theodore was able to hypothesize on the locations of Ptolemy’s ‘Diana Oraculum’ and the lost coastal sites of Moscha and Abyssapolis (his musings on the latter proving to be the major discovery of this expedition). The next phase of the journey was, somehow, to find an entry into the inner Hadramaut from the east, but their plans foundered and as soon as February 1895 (after only a few weeks’ labours) the couple were resigned to sailing for Aden, storing their equipment there, and tranship for India, where Theodore hoped he could get authorization and support (Aden falling in part under India’s purview) for a swift return to the region, but none materialized. Within eight weeks of leaving Aden, and their subsequent short stay in India, the couple were home in London (April 1895), sorting out their collections and preparing to lecture on their findings as usual. After spending the early summer of 1895 socializing in London, Mabel and Theodore were ready for a few months’ holiday in Ireland and the north of England before making plans (they hoped) for a return to the Hadramaut region. But tribal unrest in large areas of the southern Arabian peninsular – exacerbated by the slow decline in authority and power of Ottoman regional control and the corresponding acquisitive glances of, in particular, France, Italy and Germany – was to postpone the Bents’ third attempt on the Hadramaut. The geo-political situation thus put paid to their plans and the couple had to settle for a rather ad hoc tour down the west coast of the Red Sea instead. For the Bents’ 1896 (East African) expedition (in an echo of a similar and rather vague exploratory cruise the Bents made in 1886 along the coastline of western Turkey in search of chance finds) the couple decided to charter a dhow and drift south from Port Said. Having managed to assemble their gear forwarded on from Aden, where they had left it the previous season (and which included Mabel’s ‘bucket canteen, large kitchen box, empty saddlebags and large holdall, and folding stove… towels… kitchen clothes, my pith helmet and green-lined parasols also, and my hammock’), the couple could begin their leisurely boat trip down the western coast of the Red Sea along the Sudanese littoral in December 1895 with no firm objectives in mind. Theodore was content with general exploration in the hope of haphazardly uncovering evidence for early southern Arabian influence along the western shores of the ‘Erythraean Sea’: evidence perhaps with resonances of his Mashonaland (1891) and ‘Abyssinian’ (1893) discoveries. Theodore did seem however to have had an objective in mind, a glittering one. Since the mid-1880s Theodore relied annually on having some significant discovery from his adventures to announce back in London. Accordingly his ‘discovery’ in the Sudanese interior of Wadi Gabeit of extensive gold-mining remains (with the added bonus for him of glimpses of the faraway ruins of Great Zimbabwe, as well as tentative Greek, and indeed ‘Sabaean’, lettering) is the highlight of this 1896 expedition. There is every likelihood that Bent knew what he was looking for (although he called it ‘my new Eldorado’) and it explains his risk-taking in leaving the relative security of the coast, against the explicit orders of one of the most formidable British officers in Egypt, to find it. In 1896 the Sudan was only a marginally safer place than the Hadramaut for Theodore and Mabel. Sitting uneasily between Ethiopia and Egypt, the region was nominally an Egyptian dependency, but the nationalist movement under the Mahdis was a constant threat to the Khedive. The Bents were not to know, as they set off to Cairo from London (December 1895), that their government, alarmed at the unrest and the regional threat to their interests on all compass points, was planning a new British offensive – the slow vice of Kitchener’s vengeance for Gordon – a permanent end to the Dervish threat. ‘Major Wingate is doing all he can to help us in every way’, writes Mabel in all innocence from Cairo. Once again in Egypt’s capital, the Bents are soon under the watchful and amused eye of Lieutenant General Sir Francis Reginald Wingate, Director Military Intelligence, Egyptian Army. After Evelyn Baring (1st Earl Cromer) and Major-General Sir H. H. Kitchener (‘Sirdar’, commander of the Egyptian army), Wingate could look back in due course over an extraordinary career in his country’s service in the region. He is gallant enough, of course, not to embarrass the Bents when they return to Cairo to be entertained by him and his wife (who has the anxiety of her husband about to leave with Kitchener for Dongola and the Dervishes any day) at the end of their Sudanese adventures. There were two other Englishmen sharing these adventures with the Bents. As expedition naturalist, and extra photographer, they had with them Mr Alfred Cholmley ‘of Place Newton, Rillington, Yorks’. The Cholmley estates near Malton in North Yorkshire were (and remain) not far from Theodore’s boyhood home outside Leeds and presumably the families were acquainted. Mabel records that Cholmley ‘had determined to accompany us’, but the squire himself notes: ‘In the autumn of 1895 I was invited by Mr. Theodore Bent to join him in an expedition to the west coast of the Red Sea…’ By all accounts a responsible and well-liked landlord (with over 5000 acres in his care and in 1890 restoring the village school), Alfred was a lepidopterist and ornithologist of the old school, not much being safe from his gun and skinning-board: the ‘reddish-brown Sand-Partridge’ he bagged was named after him Ammoperdix cholmleyi. The other figure Wingate seconded to the Bent expedition of 1896 was more to Mabel’s taste – the dashing and soon-to-be distinguished soldier, Nevill Maskelyne Smyth of the Queen’s Bays (1868-1941). She writes that ‘Mr. Nevill Smyth, Queen’s Bays, wished to come and has got leave’, but it is more likely that he drew a short straw. From an established service family (first cousin to Robert Baden-Powell and an admiral’s grandson), Smyth was smart, trustworthy, brave, and commissioned by Wingate with the twin tasks of producing a good map and keeping his eyes open; on at least one occasion Mabel writes that he takes off into the hills to reconnoitre, looking far westward towards the Dongola reaches, where he was soon to fight in the campaigns of that summer of 1896. Once the fellowship had disbanded, and they were on their way back to London in April 1896 after a short stay in Athens, Theodore and Mabel had to face up to the fact that the Sudanese expedition had not revealed much to science. Apart from his observations on the goldmines of the Wadi Gabeit, the recorded inventory of items (as identified in Mabel’s diaries or Theodore’s articles, or in museum catalogues) brought back to London is the leanest of any from their travels. Unusually, Mabel makes no reference to the British Museum in her Chronicle, suggesting that they were not officially collecting – that is to say they had no purchasing budget from the institution. A few years before her death some of Mabel’s personal Sudanese artefacts were presented to the Museum, all of the acquisition numbers including the prefix ‘Af1926’ denoting the year they were received. These included a few personal (modern) ornaments and a few sherds and stone container fragments. Had the Bents stopped to explore Myos Hormos, or even discovered Ptolemais Theron, then their finds might have been extensive. Back in London in the summer of 1896, Theodore, with his customary rapidity, wrote the papers and articles that were descriptive of their trip, as usual using Mabel’s Chronicle for reference. (His own Sudanese notebook – one of only four that seem to have survived – remains with his wife’s in the archives of the Joint Library of the Hellenic and Roman Societies at Senate House, London.) In order of scale and scope, his three publications consisted of a short piece on the slave-trade, a well-written and fast-paced article for a popular magazine, and his major account for the RGS. This latter included many photographs, most of them taken by Alfred Cholmley, who was the main expedition photographer for once – Mabel usually fulfilled this role, and still took her cameras with her. The presentation that Theodore gave to the RGS on 1 June 1896 included a wonderful sequence of thirty-six glass lantern-slides, four of which are reproduced in this volume. They are miraculous survivors. Theodore made good use of the modern technology at his disposal and we know that four sets of his lantern-slides were kept until February 1951, at which date three of them were destroyed as they had ‘faded’. It is a sad loss of course (today they could have been treated), but by good fortune twenty-two of the original thirty-six glass slides that Theodore had prepared for his Sudan talk have survived and are rare things in the RGS archive. They are unique and include the only images of Mabel herself on expedition, as well as scenes of campsites, landscapes, antiquities, their assistant Manthaios Símos, and even ‘Draka’, their long-suffering pet dog that we are about to meet. So many of Mabel’s photographs, and Theodore’s sketches, now being lost, to have just these few slides safe is a unique resource. Concluding the literature, after his death and in her tribute volume to her husband – Southern Arabia (1900) – Mabel incorporated large extracts from Theodore’s articles, and many verbatim passages from her Chronicle, into a chapter in this still-popular work entitled ‘An African Interlude, The Eastern Soudan’.